MyAdMarket has been around since 2012 when it was established. A lot has changed in the course of time, so here is the latest review of the network as of July, 2016. Founded in 2012, MyAdMarket is one of the most reliable ad serving platforms in the market today. It is part of YesUp Media Inc. a leading Canadian marketing firm. MyAdMarket’s list of clients includes top names in the ad network industry including Popsile and CPAInventory just to mention a few. This Canadian based company offers the latest technology and tools to advertisers, affiliates, individual publishers, and ad networks. It has everything ad networks or individual affiliates need in order to track performance and earnings in real-time. They have an array of tools you can rely on to optimize inventory if you are running an ad network. Why would anyone need an ad serving platform like MyAdMarket, you may ask? Well, the idea of affiliate marketing has revolutionized the way lead generation and overall business takes place in the online environment. Affiliate marketing has opened up new opportunities for brands, businesses, and individuals to earn income online without having to worry about overhead costs associated with offline brick and mortar businesses such as hiring employees and holding inventory. This new way of doing business online makes it imperative to have a reliable ad management platform. Online entrepreneurs and marketers realize the need for advanced audience targeting, tracking, and placement options which is why many are turning to ad serving platforms with the latest innovative software and solutions such as MyAdMarket. MyAdMarket offers an all-inclusive system to ad networks and individual affiliates to create campaigns using one or a combination of different approaches such as CPA, CPV, CPC, and CPM among others. It also helps affiliates and ad networks to track their campaigns and monitor performance. Latest innovations such as the new Traffic Quality Index technology have put MyAdMarket way ahead of its competitors in the industry. When it comes to value and performance in ad management for individual affiliates and full-size networks, it has become, without a doubt, the go-to all-in-one solution. When you are looking for an affiliate management platform, one thing you’ll repeatedly come across is a diverse, and often confusing range of different options. Starting your own affiliate program, or a large network of publishers and advertisers, will require setting up affiliate accounts, stat tracking software, advertising pixels, ad creatives, and payment options just to mention a few. MyAdMarket has actually taken all these intricate requirements and combined them into one powerful solution to suit both large networks and the individual affiliates. Their platform is built to accommodate the needs of individuals, brands, and businesses of all sizes with enough room for as many campaigns, advertisers, and publishers as you need. It has an amazing selection of advertising formats for both mobile and desktop platforms, including pop-unders, interstitials, video ads, in-app advertising, and much more. Such a diverse range of ad placement options for both desktop and mobile traffic is rarely found in a single platform. As every internet marketer worth the title will tell you, tracking and split testing are the keys to any successful campaign. It has all the tools and tracking software you need to dig deep into your campaign’s stats based on different factors such as geographical region, device, language, browser, hardware, and ISP among others. Conversion tracking is also available by the use of image pixels, SDK in the case of mobile apps, and even server to server conversion tracking. It provides full transparency and reliable metrics for targeting and evaluating the quality of traffic you get. 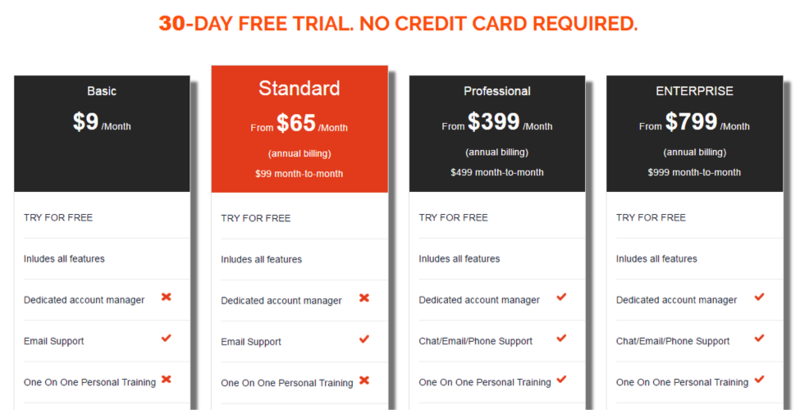 Pricing plans are quite affordable and scalable, not forgetting that you get everything in an all-inclusive deal. The difference is mainly in the amount of traffic you expect to handle every month. The basic plan goes for $9 per month and gives you 100,000 monthly impressions and a similar amount of clicks. From the basic plan you can scale up to larger plans with a greater number of impressions and clicks. Higher plans come with a dedicated account manager, a traffic quality manager, and one-on-one training with an expert in the field. There is a one month free trial too. All said and done, MyAdMarket is the platform of choice for anyone interested in running an affiliate network. What we like: All-in-one package network, which eliminates the need to look for external solutions to your ad and affiliate management requirements. They have all the tools you need to run a successful ad network in one place. We also like their affordable basic plan which gives you an opportunity to test run the platform. It supports SSL tracking and gives you server-to-server post back URLs, as well as image tracking. It also has robust anti-fraud features. What we like least: Does not support keyword targeting, but has plenty more targeting options. It also lacks invoicing features, but allows you to pay the affiliates at the end of a given period. Self-serve module: This is a self service ad system that you can plug straight into your site, allowing you to sell advertising to a wide clientele. Ad Exchange: Make use of their marketplace and sell traffic at your rates. Multiple Ad formats: A wide variety of ad formats you can offer to your clients. Brand security: All campaigns are thoroughly scanned before they go live. Traffic score: Ability to calculate the quality of traffic using data analysis and third party audit services. Comprehensive reports that give a clear picture of your expenditure and earning activities. Flexible payment option that lets you choose your preferred payment method. Ownership: Privately held by YesUp Media Inc. It has a robust security and fraud protection center for users across all subscription levels. It also features automated monitoring of ad creatives for malicious code. This is necessary to detect suspicious activity. The system has efficient technology to track all your earnings and expenditures, although it does not issue invoices. The platform provides separate members area for publishers and advertisers. Each dashboard can be viewed on both desktop and mobile platforms. The network has advanced technology that supports SSL tracking, image tracking, and even provides server-to-server post back URLs. It offers more than 10 reporting graphs, which are well positioned on the ad network’s dashboard. The graphs give concise details about your performance and growth over a day, a week, or a month, as well as a summary of your traffic by geographic location, active creative, and much more. The intuitive dashboard tells you all you need to know about your earnings and expenditures. Besides the standard support channels such as email and telephone, users on a pricing plan higher than the basic plan get a dedicated account manager to assist them with all issues, concerns, and questions regarding any aspect of their accounts. MyAdMarket may not be as big as the other networks in the market, but they have very helpful and responsive members in their support team. MyAdMarket offers publishers and app developers an efficient platform to run profitable ad management businesses that allow them to monetize their traffic and unique content more effectively. Its new user interface is quite intuitive and easy to use while providing scalable workflow to grow your business. The company, founded in 2012, is without a doubt one of the best ad serving platforms in the market today. It is owned by the reputable YesUp Media Inc. of Canada. The creators of MyAdMarket seem to have read the challenges faced by many publishers before they came up with this all-in-one solution. Publishers and app developers with large volumes of traffic or users often prefer to work with their own advertisers. However, they lack a platform where their advertisers can create campaigns, check progress, and get daily or real-time reports. They usually have to rely on external Ad Serving which can at times be quite confusing or downright inefficient. The solution to these challenges lies in an efficient network such as MyAdMarket which is optimized to ensure publishers grow their advertiser base and manage campaigns more efficiently. MyAdMarket offers an all-inclusive system to ad networks and individual affiliates to create campaigns using one or a combination of different metrics such as CPA, CPV, CPC, and CPM among others. It also helps affiliates and ad networks to track their campaigns and monitor performance. So if you are interested in running your own affiliate network, the first thing would be to sign up with MyAdMarket and start running campaigns from the quite familiar dashboard. The dashboard comes with an easy-to-use interface that gives you a bird’s eye view of all your operations. You can tell which campaigns are doing well or bad from a glance at the data and graphs in your dashboard. When it comes to value and performance in ad management for publishers and full-size networks, MyAdMarket is definitely your one-stop solution. Multiple tenancy management which allows you to manage unlimited number of advertisers all from a single platform. Does not support keyword targeting. As any publisher will tell you, when you have a large audience, managing advertisers can be a challenge. It therefore makes sense to use a good platform such as this one. When you have an ad inventory to place on your website, the most profitable route to take would be via private advertising rather than through a network. However, managing all those advertisers and campaigns on your own can be a nightmare. Fortunately, it provides a dynamic ad management platform that you can use effectively to monetize your website’s traffic or audience. It has an easy to use interface which is also fully scalable to help you grow your business to greater heights. The platform gives your advertisers access to set up and monitor their individual campaigns with ease. If you are looking for an easy hassle free option of managing advertisers on your website then MyAdMarket is the way to go.